Funny Car racer Jack Beckman raced to the current No. 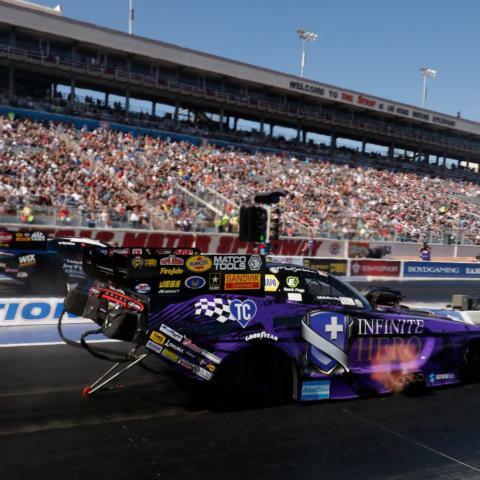 1 qualifying position in the category on Friday at the NHRA Toyota Nationals at The Strip at Las Vegas Motor Speedway. Clay Millican (Top Fuel), Greg Anderson (Pro Stock) and Eddie Krawiec (Pro Stock Motorcycle) are also provisional No. 1 qualifiers in their respective categories at the fifth of six playoff events during the 2018 NHRA Mello Yello Drag Racing Series Countdown to the Championship. Beckman leads the class with his run of 3.922 seconds at 327.19 mph during the first session in his Infinite Hero Dodge Charger R/T. Beckman has two consecutive No. 1 qualifying positions at this event, one No. 1 qualifying position on the season, but the team has struggled since the start of the Countdown. They are looking for continued success this weekend to close out the 2018 season on a strong note. "We have missed the mark too many times in the Countdown to be a contender for the championship," Beckman said. "But it is so gratifying to know that every time I drive into the race track, Friday, Saturday or Sunday, I have a car capable of running as good as everybody else, and we proved that today." Points leader Robert Hight is currently third with his run of 3.927 at 328.38, and his teammate, Courtney Force, is second with her qualifying attempt of 3.926 at 328.46. Millican leads Top Fuel following his performance in the second qualifying session with a run of 3.699 at 327.82 in his Parts Plus/Great Clips dragster. Millican trails points leader Steve Torrence by 169 markers and strives to make up ground in the battle. "We are having a heck of a year," Millican said. "We definitely want to finish has high as we possibly can. That is my goal. "Whatever that position, I want it to be as high as it can. If it is second place, it is second place, as that is my career-best point finish in NHRA." Torrence, who leads in points, is second after the first day of qualifying with a run of 3.738 at 324.67. Defending world champion Brittany Force is third with her run of 3.747 at 328.94. Anderson leads the Pro Stock category following his run of 6.638 at 205.57 in his Summit Racing Equipment Chevrolet Camaro. Anderson has nine No. 1 qualifying position this season, his last coming in Sonoma, Calif.
"My Summit Chevy loves this race track," Anderson said. "We won here last year, we qualified No. 1 last year and we are ready to do it again. I feel great about it. "Last week was good, Jason (Line, teammate) got the job done last week with the win, and we are off to a good start this weekend." Points leader Tanner Gray is 11th with a run of 6.669 at 206.32. Krawiec was able to move to the No. 1 position in Pro Stock Motorcycle during the second qualifying session with his run of 6.859 at 196.65 on his Screamin' Eagle Vance & Hines Harley-Davidson. He is currently third in the points battle and earned five bonus points in the two sessions. "It was great to come off the truck with a good solid run and collect some little points," Krawiec said. "With the points battle the way that is going on with the top three guys in the category, it is going to be tough. There is no easy round out here, you need every point you can get. "I've won championships with minimal points and lost them by as much as two, and I know how valuable they are." Arana Jr. is second with his run of 6.863 at 195.93 with his father in third at 6.822 at 196.24. Points leader Smith is in the seventh position following his best run of 6.936 at 195.34. 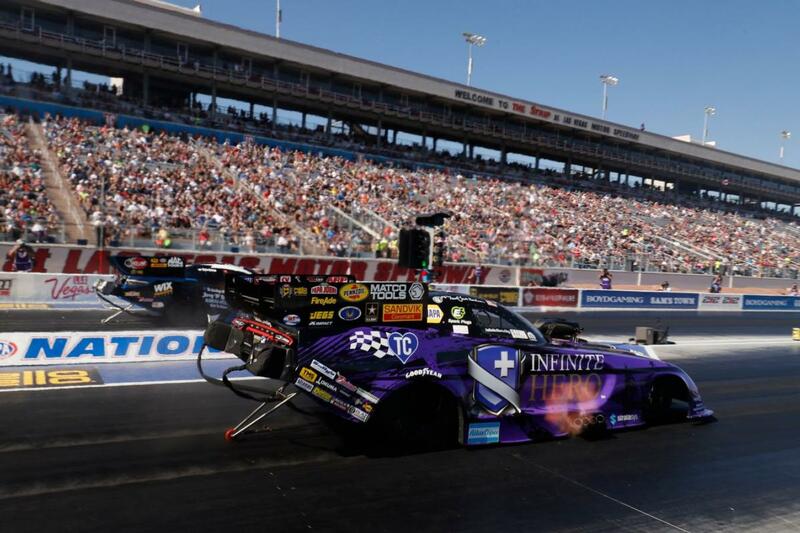 Qualifying continues at the NHRA Toyota Nationals at 11:45 a.m. Pacific Time on Saturday. Mike Castellana powered to the current No. 1 qualifying position at the E3 Spark Plugs NHRA Pro Mod Drag Racing Series presented by J&A Service portion of the NHRA Toyota Nationals. This weekend's Pro Mod racing, presented by Trask Performance, is the season ending event for the category. Castellana raced to the top spot in his '17 Camaro with his pass of 5.744-seconds at 252.10 mph. "My team would like to do good and get a win in this year," Castellana said. "So far, we are on the right track, and hopefully we can keep that up tomorrow and all day Sunday." Rick Hord is second with his pass of 5.749 at 253.33. Points leader Mike Janis is fourth with a run of 5.787 at 247.88 and Rickie Smith who is second in the championship battle is ninth following his 5.814 pass at 247.43. E3 Spark Plugs NHRA Pro Mod Drag Racing Series qualifying continues Saturday at 11 a.m. at The Strip at Las Vegas Motor Speedway. Clay Millican, 3.699 seconds, 327.82 mph; 2. Steve Torrence, 3.738, 324.67; 3. Brittany Force, 3.747, 328.94; 4. Antron Brown, 3.766, 324.28; 5. Tony Schumacher, 3.772, 330.15; 6. Leah Pritchett, 3.781, 319.52; 7. Doug Kalitta, 3.790, 321.50; 8. Billy Torrence, 3.799, 325.30; 9. Richie Crampton, 3.799, 318.39; 10. Troy Buff, 3.804, 308.57; 11. Scott Palmer, 3.814, 326.63; 12. Blake Alexander, 3.815, 323.66; 13. Terry Haddock, 4.018, 295.21; 14. Shawn Reed, 4.219, 207.40; 15. Mike Salinas, 4.415, 179.66; 16. Terry McMillen, 4.726, 159.82. Not qualified: 17. Greg Carrillo, 6.878, 83.75. Jack Beckman, Dodge Charger, 3.922, 327.19; 2. Courtney Force, Chevy Camaro, 3.926, 328.46; 3. Robert Hight, Camaro, 3.927, 328.38; 4. Tommy Johnson Jr., Charger, 3.928, 324.28; 5. John Force, Camaro, 3.939, 330.23; 6. Tim Wilkerson, Ford Mustang, 3.961, 320.28; 7. Cruz Pedregon, Toyota Camry, 3.968, 323.04; 8. Shawn Langdon, Camry, 3.969, 321.27; 9. Bob Tasca III, Mustang, 3.970, 319.52; 10. Ron Capps, Charger, 4.009, 323.58; 11. Matt Hagan, Charger, 4.022, 320.13; 12. Jonnie Lindberg, Mustang, 4.050, 314.24; 13. Jim Campbell, Charger, 4.054, 312.06; 14. Richard Townsend, Camry, 4.060, 308.50; 15. Bob Bode, Mustang, 4.253, 265.74; 16. J.R. Todd, Camry, 4.301, 225.33. Not qualified: 17. Gary Densham, 4.415, 202.55; 18. Jeff Arend, 5.828, 117.89. Greg Anderson, Chevy Camaro, 6.638, 205.57; 2. Drew Skillman, Camaro, 6.641, 206.64; 3. Matt Hartford, Camaro, 6.641, 205.88; 4. Erica Enders, Camaro, 6.642, 207.08; 5. Chris McGaha, Camaro, 6.644, 207.75; 6. Alex Laughlin, Camaro, 6.645, 205.44; 7. Jeg Coughlin, Camaro, 6.648, 206.95; 8. Jason Line, Camaro, 6.648, 206.42; 9. Vincent Nobile, Camaro, 6.653, 203.89; 10. Bo Butner, Camaro, 6.656, 207.59; 11. Tanner Gray, Camaro, 6.669, 206.32; 12. Deric Kramer, Camaro, 6.672, 206.61; 13. Alan Prusiensky, Dodge Dart, 6.675, 205.44; 14. Fernando Cuadra, Camaro, 6.686, 206.26; 15. Kenny Delco, Camaro, 6.693, 204.29; 16. Steve Graham, Camaro, 6.742, 204.08. Not qualified: 17. Val Smeland, 6.829, 202.70; 18. Tom Huggins, 6.848, 201.82; 19. Joey Grose, 6.894, 199.79. Eddie Krawiec, Harley-Davidson, 6.859, 195.65; 2. Hector Arana Jr, EBR, 6.863, 195.93; 3. Hector Arana, EBR, 6.882, 196.24; 4. Andrew Hines, Harley-Davidson, 6.911, 193.43; 5. Steve Johnson, Suzuki, 6.926, 189.39; 6. LE Tonglet, Suzuki, 6.931, 194.32; 7. Matt Smith, EBR, 6.936, 195.34; 8. Chip Ellis, Harley-Davidson, 6.937, 193.24; 9. Angie Smith, Buell, 6.949, 191.05; 10. Angelle Sampey, Buell, 6.956, 190.78; 11. Jerry Savoie, Suzuki, 6.965, 194.32; 12. Scotty Pollacheck, Suzuki, 6.969, 190.11; 13. Kelly Clontz, Suzuki, 6.972, 190.97; 14. Ryan Oehler, Buell, 6.990, 194.27; 15. Mark Paquette, Buell, 6.992, 188.49; 16. Katie Sullivan, Suzuki, 7.000, 192.74. Not qualified: 17. Freddie Camarena, 7.040, 191.57; 18. Ron Tornow, 7.071, 188.02; 19. Cory Reed, 7.134, 190.83; 20. Maurice Allen, 7.230, 184.50; 21. Anthony Vanetti, 7.271, 184.62; 22. Karen Stoffer, 8.130, 117.21. Mike Castellana, Chevy Camaro, 5.744, 252.10; 2. Rick Hord, Chevy Corvette, 5.749, 253.33; 3. Sidnei Frigo, Camaro, 5.769, 256.99; 4. Mike Janis, Camaro, 5.787, 247.88; 5. Jeremy Ray, Corvette, 5.787, 247.29; 6. Jose Gonzalez, Camaro, 5.797, 256.50; 7. Steven Whiteley, Camaro, 5.799, 251.06; 8. Michael Biehle, Ford Mustang, 5.808, 254.95; 9. Rickie Smith, Camaro, 5.814, 247.43; 10. Chad Green, Corvette, 5.827, 245.23; 11. Marc Caruso, Camaro, 5.849, 245.23; 12. Clint Satterfield, Camaro, 5.851, 248.39; 13. Bob Rahaim, Camaro, 5.861, 243.50; 14. Steve Matusek, Camaro, 5.862, 247.66; 15. Jim Whiteley, Camaro, 5.863, 245.63; 16. Khalid alBalooshi, Camaro, 5.894, 243.63. Not qualified: 17. Steve Jackson, 5.894, 241.41; 18. Scott Oksas, 5.910, 238.60; 19. Doug Winters, 5.946, 241.11; 20. Harry Hruska, 5.985, 249.63; 21. Shane Molinari, 6.736, 205.82; 22. Brandon Snider, 7.417, 133.42; 23. Danny Rowe, 7.431, 134.71; 24. Todd Tutterow, 10.910, 81.43; 25. Chip King, 11.323, 95.88.